310 pages | 14 B/W Illus. This new edition includes increased coverage of trans visibility and activism, LGBTQ studies and critical masculinity studies, global developments in women’s political leadership, links between gender and economic wellbeing, and cyberbullying. Supporting theory with examples and case studies from a variety of contexts, suggestions for further reading, and a detailed glossary, this text is an essential read for anyone approaching the study of gender for the first time. "Wonderfully comprehensive while focusing on the basics. In a time when there is an increased understanding of the complexity of gender, it can be overwhelming to introduce novice students to the topic. 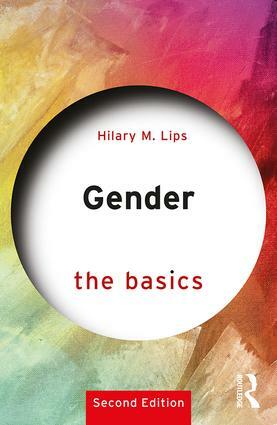 However, Lips concisely outlines the key issues with excellent coverage of current and classic theories and research from around the world while using stimulating examples that will keep students engaged as they develop the foundation needed in order to master the complexity of gender." "From first to last, this is a thoroughly scholarly and feminist review of theory and research in the psychology of women and gender. Dr. Lips has accomplished the difficult feat of providing a succinct overview that is nevertheless impressive in scope. Topics will be engaging to students at the introductory level and will be practical refreshers for more advanced study. Importantly, chapters provide a structure for comparisons among perspectives that will facilitate civil and tolerant class conversations. Ultimately, students will gain intellectual maturity and a more nuanced understanding of gender and feminism." "Gender: The Basics offers an excellent and comprehensive introduction to gender and its intersections with other systems of power , privilege, and oppression. Reading the second edition, I was reminded in vivid detail of how gender is embedded in all aspects of biological, psychological, and social life, from the way in which our personal relationships unfold to the power dynamics governing institutional practices. New to the second edition is a chapter on theoretical frameworks regarding gender that will delight students and scholars from multiple disciplines for distilling many complex theories to an accessible level. Hilary Lips is a magnificent writer, relying on a deep knowledge of gender as identity, relationship, and social structure in lifespan and global contexts." "In Gender: The Basics, Dr. Hilary Lips outlines the major topics needed to understand all things gender while bringing every page to life. She uses her expertise to break down complicated theories and explain empirical studies in an approachable and engaging manner. Plan to finish The Basics with a thorough understanding of just how pervasive, and complicated gender is in today's world."